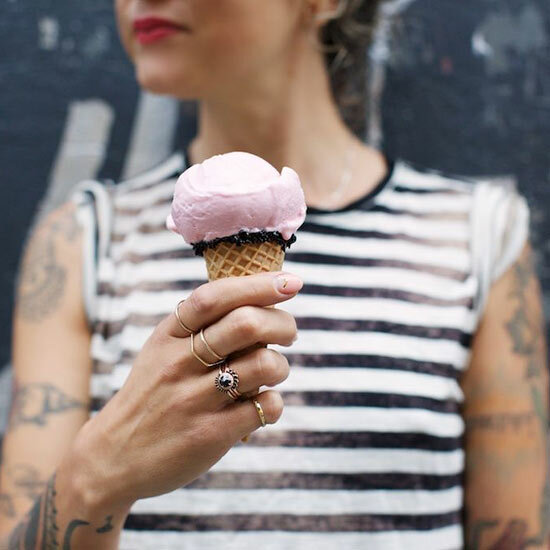 Jewelry designer Anna Sheffield collaborated with Morgenstern's Finest Ice Creams on a limited-edition flavor: prickly pear frozen yogurt with candied black sesame seeds. What do black diamonds taste like? That's the first conundrum that NYC-based jewelry designer Anna Sheffield tackled with Morgenstern's Finest Ice Creams to create the parlor's first limited-edition flavor. With owner Nicholas Morgenstern, they settled on candied black sesame seeds, which appear with a prickly pear frozen yogurt for a combination titled Rosette. The two talents became friends over the construction of their neighborhing stores on New York's Lower East Side and first worked together on a jewel-themed dinner at El Rey, Morgenstern's fantastic new luncheonette with chef Gerardo Gonzalez. "In the early days, Gerardo would let me sample new items he was trying for the menu–and I would remark something along the lines of 'it's like a garnet! It's perfectly emerald! This tastes like rubies!' So the first thoughts of a collaboration were born then," remembers Sheffield. For her first ice cream, Sheffield referenced one of her signature engagement rings: "I often mix rose gold and black diamonds, an unlikely combination for fine jewelry, but very much my brand. Thinking about a circular ice cream scoop, I finally decide the best direction would be the Rosette. Gerardo loves unusual ingredients, and chose prickly pear fruit for its flavor and lovely shade of pink. It was Nick's brilliance that mixed it with yogurt instead of cream to make the sweet and tart combination that's the perfect rose gold color." The final step: recreate the bling. "All that was missing was something tiny, earthy and sparkly to represent pavé black diamonds–which Gerardo also perfectly nailed with the candied black sesame seeds." In addition to Sheffield (whose flavor is available through December 1), Morgenstern teamed up with other downtown trendsetters on a series of genius flavor collaborations that will be unveiled on November 1. Food & Wine has the first look at the lineup, below. Ivan Ramen: Tokyo Yuzu Shio Crunch (salted yuzu ice cream with buckwheat cookies), available from 11/1 – 11/7. available from 11/8 – 11/14. The Cannibal: Radler Shandy (Schoppenhoffer Wheat Beer ice cream with Life Cereal), available from 11/15 –11/21. Bun-ker Vietnamese: Bun-ker Chunk (shiso leaf, Vietnamese mint, lemongrass and Thai purple basil ice cream with chocolates chunks), available from 11/22 – 11/28. El Rey Coffee Bar & Luncheonette: Mexican Mocha (Abuelita chocolate, coffee, cardamom and fresh peppermint ice cream), available from 11/29 – 12/5. Estela: Oligato! (Varnelli Caffe Moka liqueur ice cream with kalamata crisps), available from 12/6 – 12/12. Parlor Coffee: Fig Jam Karatu (Kenyan coffee ice cream with white pepper fig jam), available from 12/13 – 12/19. GG’s: Bobby's Peanut Butter Crunch (Peanut-butterscotch ice cream with butter crunch cookies), available from 12/27-1/2/15.